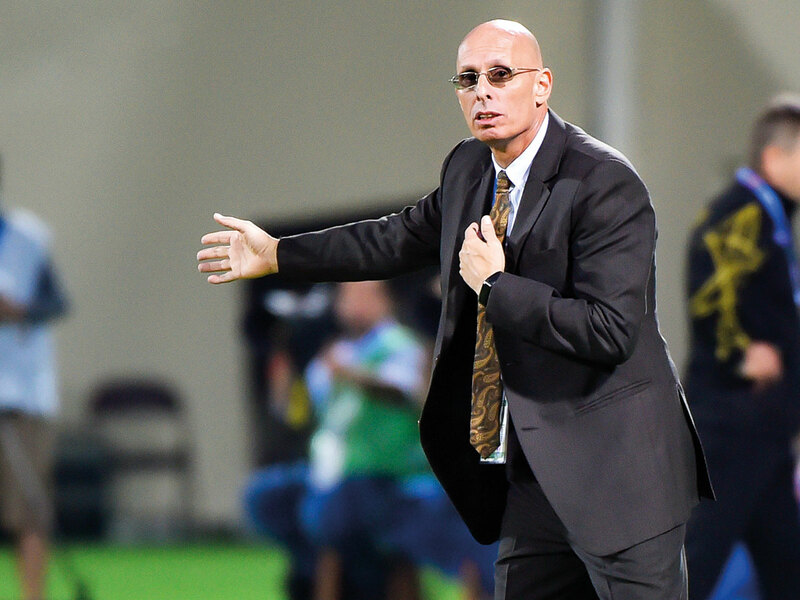 Sharjah: Star striker Sunil Chhetri led the tributes as an emotional coach Stephen Constantine stepped down after guiding the Indian football team into a sense of belief and purpose. Constantine, whose contract was up for renewal at the end of this month, was serving his second stint with the Blue Tigers since January 2015. The 56-year-old’s first tenure was over a four-year period starting in 2002. The Blue Tigers were in second position in Group A going into their final round match where they needed either a win or a draw against Bahrain. But India conceded a 90th minute penalty — converted by Jamal Rashid Abdul Rahman — and Thailand snatched a 1-1 draw with the hosts as both teams automatically went through to the Round of 16. Bahrain also made it as one of four best third-placed sides. India began with a brilliant 4-1 thrashing of Thailand, only to be followed by 0-2 and 0-1 defeats against the UAE and Bahrain, respectively. “I am stepping down after this game. I have been here for four years and during this time we have broken a few records. I have to thank the AIFF for the support they have given me. I feel my cycle here is finished and it is time to move on,” Constantine told media at the post-match conference. “They are a much better team than before. We have a proper team now and they need to qualify and play in such big competitions on a regular basis now as they have the talent pool to do that, I don’t think it’s the saddest day for me. It is my wife’s birthday but these things happen in football. You don’t get enough after putting in so much. The players have been fantastic. I have not been with my daughters for a long time and it feels good to go back home,” a choked Constantine said as he left the conference room. Chhetri — who reportedly had fallen out with his coach recently — led the tributes for the outgoing Constantine. “We didn’t know before the game. He spoke to us and told it in the press conference. He did really well for the country. If you see the records, the number of boys he has given chances. I just want to thank him from me and the boys for doing a great job and just hope wherever he goes, wish him all the luck,” Chhetri said. “I am disappointed and angry. I don’t think we played the same way we played the first two games [Thailand and UAE]. It tells you that in this level, there is no 95 per cent. We have got to give 100 per cent every game. Although we did defend well, we defended too much. We should have kept the ball more. Sometimes when you just need a draw, this is what happens,” the 34-year-old reflected. Chhetri, who on Monday equalled Bhaichung Bhutia’s record of 107 games for the country, refused to put down India’s performance to mere fatigue. “It was mental too because if you keep giving the ball, it is not easy to defend for 90 minutes. At some point, we had to be brave and keep the ball like we threatened the UAE. We had more chances than them [UAE]. Today, we had only one or two half chances. It was easy for them. It is something we learn and hope we become better after this,” he shrugged. Chhetri’s strike partner Jeje Lalpekhlua, who came in as a second half substitute, also heaped praise on the outgoing coach. “I would like to thank him. He did so many good things for Indian football. He came in when we were around 175th. Look where we are now. We qualified for the Asian Cup and he did what he set out for,” the Chennaiyin FC striker said. Goalkeeper Gurpreet Singh Sandhu echoed similar sentiments. “He told us he was going after the match. It is very sad to see him stepping down. All the team is grateful for all the work that he has done in the past four-five years,” the Indian goalkeeper said. “We would miss him a lot and I just hope that he goes to a better place and we wish him all the luck,” the 26-year-old added.